This course gives you hands-on experience of a digital UX design project from start to finish in an intense one day workshop. On this course you take a project through a complete design life cycle from initial research, to ideation, to design, to user testing. As well as gaining practical experience of some of the most common user experience design methods, as you work through the project you learn the principles behind them so you can make good decisions about what approach and methods will get you the best outcomes for your own projects. The goal of the day is for you to be able to take what you learn and apply it immediately to your current projects, and also use what you learn as a base for further study. Digital designers – web, interaction and UX designers who want to build on their UX skills, put into practice approaches they have read about, adopt a user centered design approach or better their understanding of the principles behind common UX design methods. Graphic designers – traditional designers who want to transition into digital design or learn how to work better with their UX colleagues. Strategists and analysts – senior practitioners who want to gain an understanding of the principles of user experience design and experience how those principles are practiced on the ground. 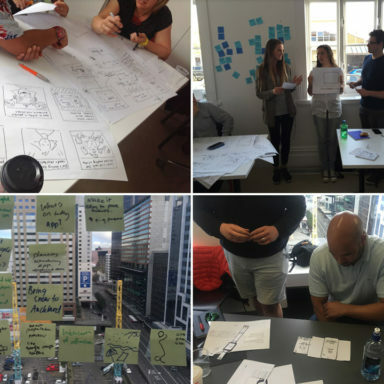 Developers – developers who want to build on their UX skills or learn how to work better with their UX colleagues. Product owners and project managers – product owners and project managers who want a better understanding of how a user experience design approach can get them better outcomes on their products and projects. You will learn the basic principles of user experience design including its history and common terminology used.